In recent years, Google have started tailoring their search results more and more. It makes sense for them to do this, as it presents each user with more relevant and higher quality search results whenever they make a query, but it can cause a problem when you’re looking for something specific, especially for SEO purposes. Luckily though, there are a number of search prefixes (or search operators, or query options) that allow you to automatically filter the results you see. These make it a little easier to get exactly to what you want without having to trawl through pages of results. We’ve put together a list of some of them and what they do, below. Depending on the word you’re looking for, Google will sometimes present you with the dictionary definition for it within the first few results. In other cases, it won’t. Using the “define:” prefix (or “meaning:”, which does exactly the same thing), will present you with the definition immediately, with no need to read through countless articles on the subject. This one is now a bit obsolete, as Google tends to automatically spell check everything you type in, before presenting you with one of those rather patronising “Did you mean…” messages. The only reason you’d need to use this is if you find the aforementioned patronising messages to be just too much. So, a slightly pointless one, but you can’t say we’re not thorough! This is a really useful one for checking the quality of the backlinks to your website. Putting the prefix “link:” in front of your domain will present you with all the pages that include links to that URL. You can also use it to check out what links your competitors have, highlighting possible opportunities for yourself. Another useful tool for finding potential backlinks, the “related:” prefix will show you all sites that Google considers to be relevant to yours. One of the most important ranking factors is relevancy, so this is a great way to find any websites with a similar subject to yours that are a great place to put a link to your website. The “site:” prefix will restrict the search results into showing results from a single domain. This can be really useful when you’re trying to find the right landing page for the keyword you’re targeting, or if you’re wanting to check which pages are surfacing in the Google search results after a site restructure. We’re firm believers that the URL of your landing page is one of the most important onpage factors when considering SEO, which makes this tool a useful way to check out the competition. Using “allinurl:” followed by a keyword phrase will filter the results to show only pages that have each word specified within the URL. You can use it to get ideas on what URLs are working well with competitors, or combine it with other prefixes to check on the optimisation of your own site. The “inurl:” prefix is similar to the “allinurl:” search prefix, but only applies to the next word in the query. It will show all web pages with that word within the url, and search for any other words given throughout the rest of the page. If we were to use the query to the left, for example, Google would show all landing pages that include the word “keyword” within the URL, and the word “phrase” anywhere else on the page. This is basically the same as the “allinurl:” prefix, except it showcases all pages that have the desired keyword within the page title. Whilst that might not seem like a huge difference, it can have an impact on the amount of results you see, and the order of the rankings. Again, this is the same as the “allintitle:” prefix, but only searches the title for the first keyword given, before searching the rest of the page for any other words you’ve included. This can be really useful if you’re trying to find a page about a specific part of a subject. For example, “Intitle:SEO backlinks” would search for any page that has “SEO” in the title, and the word “backlinks” anywhere else on the page. This prefix is really useful when your website is down, as it will show you the versions of a domain that Google has cached. What does cache mean? A cache is a temporary file version of your website that Google saves. It makes it easier to load the page from their results and, similarly to “site:”, let’s you know that Google is crawling your site properly. This prefix shows you all the information that Google has about the domain in question, including cached versions, related sites, linking sites, mentions, and all pages within the domain. It’s basically a collection of many of the other prefixes listed above. Similarly to “allinurl:” and “allintitle:”, this prefix allows you to look for text within the links on a page. Combined with the “link:” prefix, you can use this to check the anchor text for any backlinks to your website. This prefix will notify Google to search only the anchor text within a website, and then list the results ordered by number of anchor texts that match the specified keyword. As well as the title, url, and anchor text, your content is an important indicator to the Google search bots as to the relevancy of your site. You can use the “allintext:” prefix to check that your content is up to scratch, or to check out the competition once again. As the name might suggest, this prefix allows you to search for particular file types. It can be really useful for finding content marketing ideas (have a look at some of your competitors’ downloadable PDF’s), or checking that all the media on your website is up to scratch. And, of course, it’s useful for when you’re trying to find that one file that seems to have gone missing. Digital marketing is a constantly evolving industry. There are regular updates to search algorithms, pay-per-click tools, and new marketing strategies. Because of this, you’ll need the most up to date information in order to get ahead. The “daterange:” prefix only works with Julian calendar dates though (don’t ask us why, ask the Google developers), so here’s a Julian calendar converter, in case you need it. This prefix is really just a shortcut, taking you straight to the Google Maps search results for your query. It saves that single click that changes your results, so it’s not entirely useless. Time is money, after all. If you need to get in touch with a client or supplier as a matter of urgency, and don’t want to search their website for contact details, put “phone:” in front of the company name. Google will then search for anything that looks like a phone number and show it in the results. And there we have it. 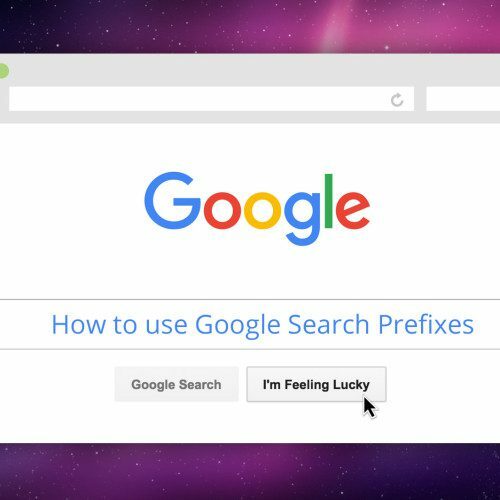 Some of the most useful Google search prefixes, and what they do. You can mix and match multiple prefixes in order to get the exact results you want, and make the search results even more focused. Have a play around with them, and let us now what you think!